Construction Driveways l Dirtwirx Inc.
Get your driveway done the Dirtwirx way. Driveways often get overlooked when homeowners embark on increasing the curb appeal of their house. A beautiful flower garden and fresh exterior paint certainly can do wonders, but it can’t hide an ugly, faded, cracked and gravelly driveway sticking out like a sore thumb. A driveway takes up a lot of space on your property, so if you want curb appeal, you’ll want an attractive driveway. And if you have a brand-new home that needs to have its first driveway installed, you want to make sure to get a high-quality driveway that will still look beautiful in the years to come. Despite the large equipment we often use, we can do very precise work and maneuver in smaller areas. Sure, you want a space cleared and flattened for a driveway, but only for a driveway—not your entire front yard! Our professional crews are courteous and can work within smaller areas. We can clear vegetation or brush from the site, flatten, level and grade the path for the driveway and prepare it for a smooth installation. Getting your driveway done the Dirtwirx way means you get nothing but the best. For construction sites, we can also create access drives for equipment and machinery. Gravel is a great choice if you have a small budget and need a functional driveway. Gravel is the least expensive material to install. The driveway area should be cleared and graded to ensure proper drainage. After that, it’s basically as simple as getting a truck load of gravel dumped in the middle of your intended driveway and then spreading it around. The main drawback of a gravel driveway is that it is high maintenance. A new load of gravel will need to be spread over the top every so often. Heavy rains or floods can dislodge your entire driveway in a single afternoon. Gravel areas are also prone to developing dips and holes, and weeds can creep onto a gravel area and turn it into an eyesore. Driving on gravel kicks up a lot of dust, which your asthmatic family members, friends or neighbors may not appreciate. And it can be difficult to shovel snow off of a gravel driveway without also shoveling away much of the gravel. In short, gravel generates complaints in all kinds of weather, but as a short-term solution until you can afford an upgrade, gravel does the job. Concrete is the second cheapest material for driveways, typically costing $2 to $4 per square foot for a plain, uncolored concrete. Concrete is easily customizable, and you can have your concrete driveway stamped to look like pavers were used or have a unique color added to the concrete mix if you can afford these extra bits of flair. Concrete is generally tough and low-maintenance, and it will be especially easy to maintain if it is installed correctly by professionals like the Dirtwirx team. If the ground underneath a concrete driveway is inadequately prepared before the concrete is poured, the concrete could crack later on as the ground settles and shifts or as strong, invasive tree roots wedge up and under the surface. Typically cracks of this nature are aesthetic in nature and do not majorly affect the safety or stability of the driveway. Concrete is also susceptible to damage from road salt, and unsightly oil stains can be difficult to wash out of a concrete driveway. 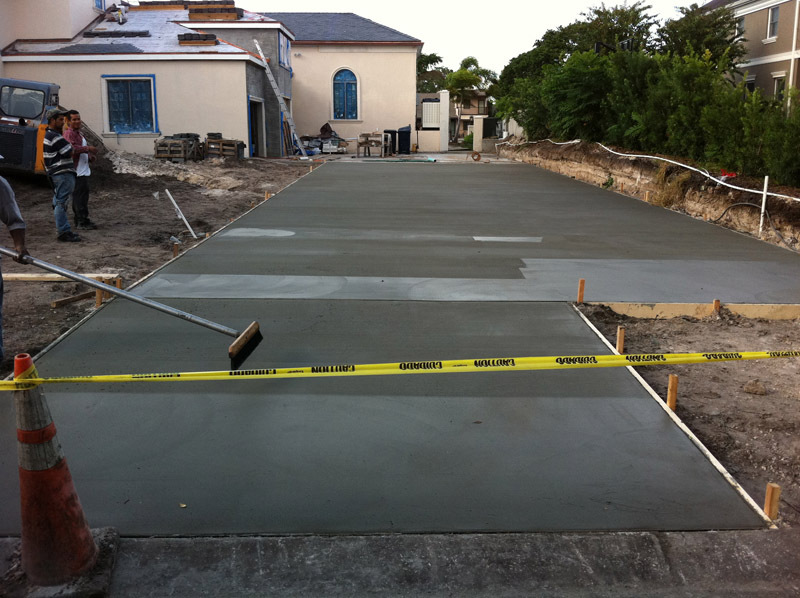 However, once you have a concrete driveway professionally installed, it should last for over 30 years. Asphalt is a popular option for driveways because it is less susceptible to cracking and staining than concrete. Asphalt is an impermeable material and thus unaffected by chemicals that may come into contact with its surface, like oil or road salt. It also is very durable in the face of extreme weather and is unlikely to erode from heavy rains or to crack from ice. The price of an asphalt driveway can vary considerably depending on whether brand-new or recycled asphalt is used. The maintenance of an asphalt driveway varies somewhat as well. On the bright side, it is very easy to fix any blemish that might occur in an asphalt driveway, because a new layer of asphalt is simply added to the top. However, in order to remain resilient, asphalt driveways need to be resealed every few years, which is an important factor to consider when deciding which driveway is right for your budget. The typical asphalt driveway lasts for about 20 years. Pavers are the fourth and most expensive option for driveway materials. They provide a timeless, classy look to a driveway, offering the best combination of form and function. Like concrete, pavers offer a wide range of customization. You can choose different colors and shapes, then have them installed in an intricate design. Who said sidewalk chalk was the only way a driveway could count as art? Pavers themselves come in different materials, including concrete, brick and stone. The material you choose will influence how durable and how expensive your paved driveway will be. There are even some manufacturers taking pavers to the next level, offering glow-in-the-dark options and other unique features. Some pavers are permeable, meaning that water can pass through and into the ground below, which could be a useful option if you are concerned about water conservation or if your area is prone to flash floods. Depending on the features you choose, having a paved driveway installed could cost as little as $5 per square foot or as much as $50 per square foot. Heated driveway – That’s right, with a heated driveway you can permanently retire your snow shovel. And you’ll never have to buy de-icing products again. This is a technological luxury that perhaps isn’t required for our Texas clients, but for our friends up north, a heated driveway is a real advantage. Curved driveway – If your house is located along a busy road, it might be a nightmare to try to back out of your driveway each morning during rush hour. With a curved driveway, you have two entrances/exits, thus allowing you to exit your driveway head-on each time. This gives you greater visibility and is simply easier to maneuver. Two-lane driveway – A two-lane driveway can make life a lot easier when there are multiple drivers in your home, each with his or her own beloved car. Rather than having to hop into your car to let someone else get out of the driveway, invest in a two-lane driveway or a design that is similarly useful for multiple drivers, such as a curved driveway. The extra space can also make it easier for you to have guests over to visit, especially if you live in an area with little to no on-street parking for your visitors. The cost of your new driveway depends on a number of factors, such as how much site prep work is needed (demolition of existing driveway, land clearing, land grading, etc. ), the total square footage of the proposed driveway and the desired material. Gravel is the cheapest material for a driveway, for example, but a stone-paved driveway is among the most expensive. Give us a call today for an estimate on the cost of your new driveway.